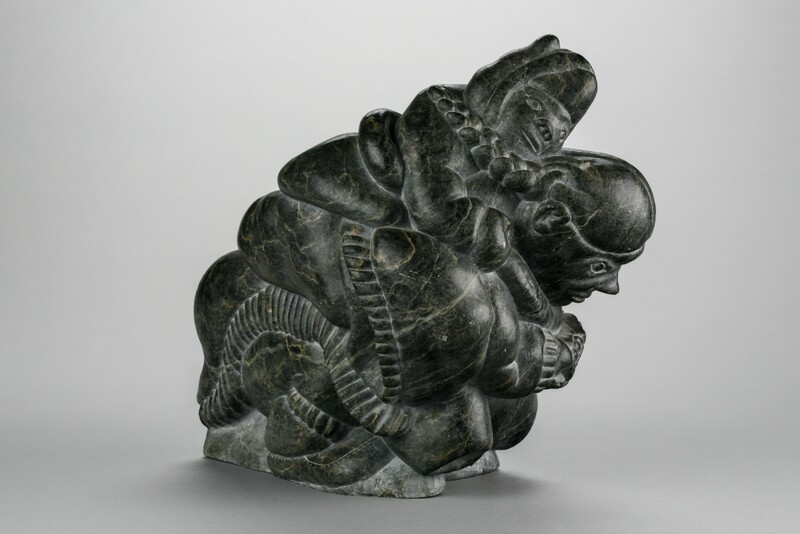 Born in a camp near Inukjuak, Québec, Noah Echalook is an Inuit sculptor who learned to work with stone through his uncle Lucassie Echalook. The subjects of his first, small sized sculpture were depictions of animals like fish, bears or geese. He also liked to sculpt scenes depicting hunting, fishing and traditional Inuit stories as well as women carrying out domestic tasks. Starting in the 1970s, his work was regularly shown in commercial galleries. At Expo 67 in Montreal, he demonstrated his talent and sculpting techniques. Noah Echalook had his first solo exhibit at the Raven Gallery in Minneapolis, Minnesota in 1979. Several of his pieces are found in permanent collections, including that of the Amon Carter Museum of American Art in Fort Worth, the Art Gallery of Ontario and the Royal Ontario Museum in Toronto, the National Gallery of Canada in Ottawa and the University of Lethbridge Art Gallery.